After their first four games in the National Premier League, Holcombe, with just 3 points from the opening weekend, face an uphill fight in January to maintain their top-flight status. Scorers: Canterbury HC: Eliza Brett, Sarah Kerly, Grace Balsdon. Holcombe HC: Ellie Watton (x2), Harriet Pittard, Lucy Wood. 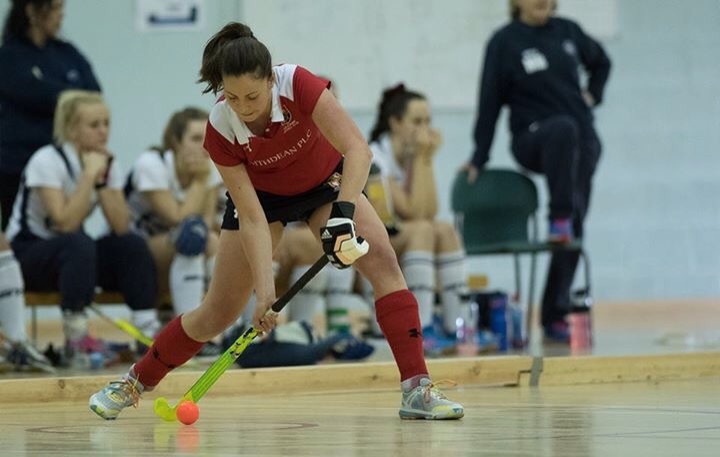 Holcombe and Canterbury opened their accounts in the England Hockey Super 6’s Premier League on Saturday as they faced off in a battle of Kent’s finest. Having made the trip to Wembley for the post-season last time around, Canterbury were keen to get off to a promising start against their local rivals and league-newcomers Holcombe. In a patient opening 10 minutes, chances were kept to a premium with neither goalkeeper really being tested. Both defensive units held strong and inevitable lack of clinicalness in the final third of the court from the Kent sides contributed to a cautious and uneventful first quarter. 14 minutes into the contest and Canterbury were able to convert a period of sustained pressure into the first penalty corner of the match. With Holcombe losing a player to an early break, Grace Lawes charged down the initial strike with a fantastic stick save to keep the scores level. Lawes’ agile save proved to be the catalyst the game needed as chances came thick and fast to close the half. Just a minute later, Ellie Watton broke through the Canterbury defence and produced a fine save from Helen Fagg in the Canterbury goal who was sharp off her line to maintain parity. With just 3 minutes to go in the period, Emma Trunks stole the ball on the left boards before eliminating her player and winning Holcombe’s first penalty corner of the campaign. A slick variation that went back to the injector was deflected home by Watton to open her side’s account for the season. There was still time for Canterbury to win another penalty corner before the break but a combination of Lawes and Trunks were able to charge down the initial strike and clear to the far side of the court. If the opening to the first half was a cagey and nervous affair, the start of the second was anything but as both sides came out determined to stamp their authority on the contest. Some strong early passages from the Holcombe outfit earned them an early penalty corner that Harriet Pittard converted with a trademark flick around the on-rushing Becca Smith to double their advantage. Canterbury responded almost immediately with a goal of their own. Pressing higher up the court, they turned the ball over on the left board and a swift transfer opened up the back post for Eliza Brett to convert from close range and halve the deficit for the Polo Farm side. Shortly afterwards, it was Holcombe that extended their lead again. A moment of brilliance from Lucy Wood saw her win the ball in her own circle before carrying the entire length of the court and calmly finishing in the bottom corner. Further pressure for Holcombe led to another penalty corner shortly afterwards as Kevin Johnson’s side looked to close out early. Good defensive lines from the Canterbury defence negated the initial pressure but Holcombe maintained their dominance to win another, A well worked routine was saved on the line and an efficient counter attack saw Captain Sarah Kerly finish in space to halve the deficit for the second time in the contest with just 7 minutes to play. Three minutes later and a swift attack down the right boards earned Holcombe another penalty corner. In a repeat of their opening routine, a close deflection from Watton saw her double her personal tally for the afternoon whilst extending Holcombe’s advantage yet again. Canterbury immediately pulled Smith from their goal in favour of a kicking back to regain ascendency. A fantastic double save from Lawes kept Canterbury at bay before their pressure was finally rewarded with an overtime penalty corner. Two re-awards led to a variation as Balsdon, donning the kicking back responsibilities, saw her straight flick strike the body of Leah Wilkinson on the line. With a penalty stroke awarded, Balsdon stepped up to convert the consolation for her side as an enthralling second half finished 4-3 to Holcombe in the first ever Premier League Indoor game. 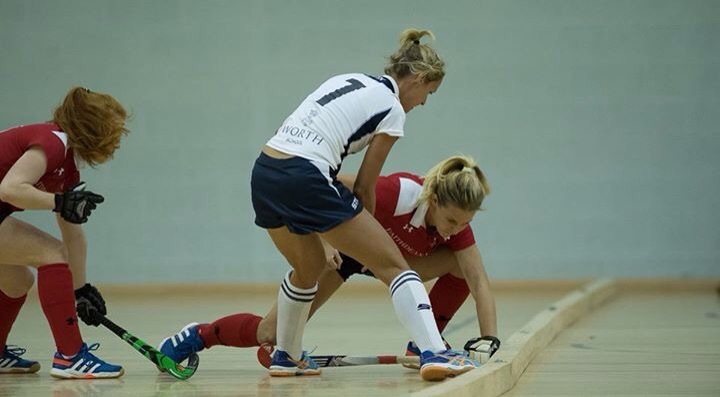 Scorers: Holcombe HC: Ellie Watton, Nicola White. With the University of Birmingham going down 7-2 earlier in the day to early pace-setters Bowdon Hightown, Holcombe went into the game knowing the danger that would accompany the desperation with which the students would be chasing a valuable three points. In stark contrast to their first game of the day, an open and direct first 5 minutes of play led to a number of openings at both ends of the floor. Grace Lawes had to be alert to deny a couple of early snap-shots from the students but it took all of 4 minutes for the breakthrough to come. A smart finish from Jo Turnbull in a crowded circle gave the students a deserved early lead. Shortly afterwards, the lead was doubled through a penalty corner from Lucie Daman. Her straight flick from the top of the circle rounded the on-rushing Lawes, beating the defenders on the goal line. Some poor structure from the Kent side cost them the chance to gain a foothold in the contest and a time out from coach Kevin Johnson at the end of the first quarter of action wasn’t enough to stem the flow of critical errors. Continuing to outlet with 3 at the back, Holcombe stifled their own creativity and chances were subsequently few and far between. As the half wore on, their individual quality showed as they built a period of sustained pressure. Consecutive penalty corners just before the interval were well dealt with by the students as their resilient defence assured their two goal cushion at the interval. UOBHC wasted no time in settling back into their rhythm in the second period. 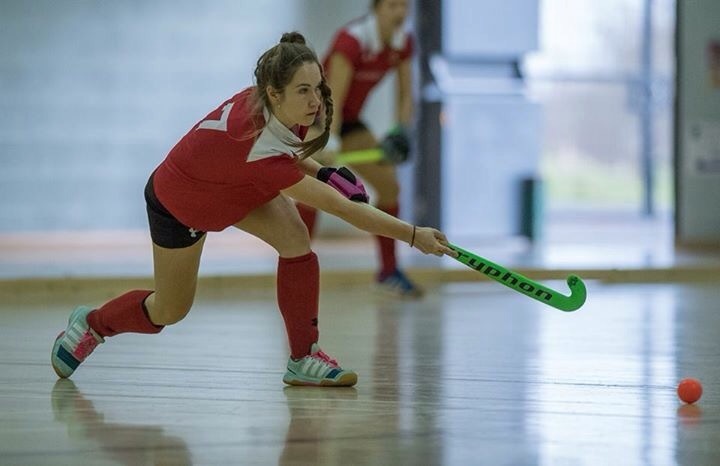 With Holcombe struggling to put any patterns of play together, England U21 International Alicia Collard, fresh from the recent Junior World Cup in Santiago, Chile, calmly slotted the students’ third after a clinical move down the right boards. Just four minutes later and Holcombe were granted a lifeline when Nic White’s through ball was finished by Ellie Watton to reduce the deficit to two. With just 7 to play, Harriet Pittard’s straight flick from a Holcombe penalty corner struck Collard on the line and Nic White despatched the subsequent penalty stroke to set up a tense finale at Phoenix. The Kent outfit continued to struggle with their patterns and the resilient defence of the University side ensured Katherine Somerville remained largely untroubled in goal. With just 4.34 left on the clock, a mis-trap from Pittard on the left boards allowed Collard to break into the Holcombe circle and finish on her reverse to extend the Birmingham lead. Grace Lawes was immediately removed from goal in favour of a kicking back as Holcombe looked for a way back into the contest but they couldn’t make the extra numbers count. 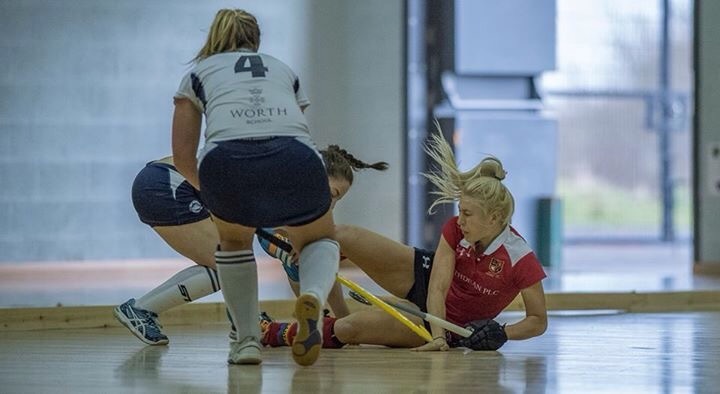 An overtime penalty corner was comfortably dealt with by the UOBHC defensive line as Holcombe had to endure a frustrating loss to end their first day in the England Hockey Premier League Super Sixes. Scorers: East Grinstead HC: Emma Lee-Smith, Bara Kavanova. With the chance to regroup and spend some valuable time together as a team on Saturday night, a renewed Holcombe side faced the reigning champions, East Grinstead, in their third game of the Premier League Super Sixes. Having struggled in their opening two fixtures, the Saint Hill side were looking for their first win of the campaign as they looked to keep pace with early front-runners Bowdon Hightown in defence of their championship. Having rectified the inadequacies in yesterday’s second performance, a different Holcombe side took the court on Sunday, playing with the intensity and discipline required to compete at the top of the domestic game. Both sides demonstrated strong defensive structures as early chances were hard to come by for both offensive units. An early penalty corner for East Grinstead broke down at the top as circle action remained limited throughout the first quarter. Aurora Mears, preferred to Grace Lawes in goal for the Kent side, made a number of smart saves as East Grinstead began to assert themselves on proceedings. Some patient build-up from both sides helped to build some sustained pressure but it wasn’t until 14 minutes in that it was finally made to pay. A direct ball into the top of the Holcombe circle fell kindly to Emma Lee-Smith who made no mistake in finishing past the stranded Mears. With less than a minute play in the half, East Grinstead doubled their lead with a similar play. A direct ball from left back found the stick of Bara Kavanova who deflected the ball low into the bottom left corner to deliver a critical blow just before the interval. After the break, Holcombe dominated proceedings, moving the ball crisply around the court and forcing East Grinstead deeper and deeper towards their own goal. The reigning champions held firm and launched a couple of counter attacks of their own before Holcombe were able to win their first penalty corner of the game with 11 minutes to play. Emma Trunks’ straight flick was brilliantly charged down by Becky Waters in the East Grinstead goal but the rebound fell to Leigh Maasdorp who made no mistake in finishing on her reverse from the edge of the circle. Holcombe began to pile on the pressure and East Grinstead were indebted to Waters who pulled off a string of fine saves to preserve their lead. Consecutive Holcombe penalty corners were charged down well before a fine stick save to prevent Lucy Wood from close range. East Grinstead wrestled back momentum as the half wore on and a late penalty corner was competently dealt with by the Holcombe defence. Mears was withdrawn with two minutes on the clock as the Kent side again went to a kicking back but to no avail. 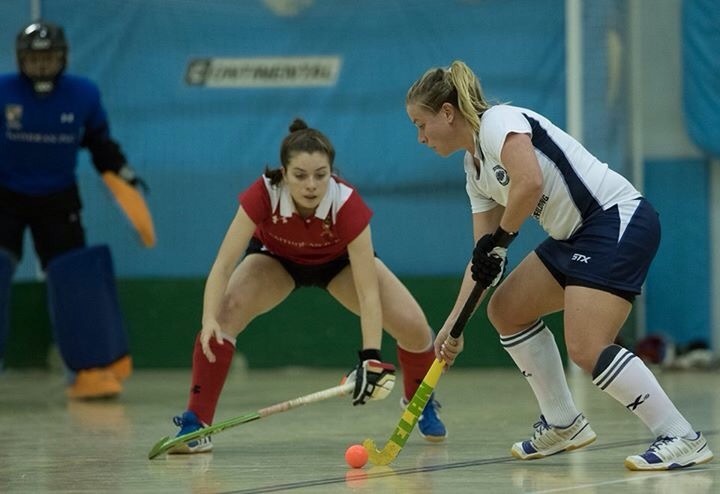 The champions held firm to claim their first three points of the campaign in an entertaining exhibition of structured indoor hockey that threw the playoff race wide open. Holcombe’s final game of the first weekend came against high-flying Bowdon Hightown. Perennial playoff participants and title-challengers, the Manchester outfit made a real statement on the opening day, scoring a monumental 17 goals cross their two fixtures. Kevin Johnson’s side were desperate for points to ease some of the pressure that would accompany their final four games of the campaign in January, when the league commences after the Christmas hiatus. In a lively opening period, both sides came out playing some hard, physical hockey. Holcombe began the stronger of the two, winning an early penalty corner after some great work from Emily Maguire on the right boards to steal the ball high up the court. Her subsequent straight flick just missed the target as Bowdon responded with a penalty corner of their own that was brilliantly saved on the line by Leah Wilkinson. Just 5 minutes in and Bowdon were rewarded with the opening goal. A slick one-touch passing move carved open the Holcombe defence, leaving Charlene Mason to convert from close range. The response from the Kent side was instant. Within the minute they had won a penalty corner of their own that Leigh Maasdorp despatched high to the goalkeepers’ right to restore parity. The game continued to ebb and flow as the half wore on. Bowdon were structured and methodical in their attacking exploits but were largely kept at bay by some resolute Holcombe defending. Some good work down the right boards from Emma Trunks and Steph Elliott opened up the Bowdon defence with the latter winning a penalty corner 11 minutes in. Consecutive corners went begging and Holcombe were made to pay five minutes later when a Bowdon penalty corner of their own was finished with a straight flick from Sally Walton. Just before half-time, Bowdon added a third under controversial circumstances. After an initial scramble at the top of the circle, the ball trickled through to Lisa Garbutt at the back post. With the ball striking her foot and play subsequently stopping, the obvious and required whistle never came. Garbutt duly rolled the ball over the line to the dismay of the Holcombe team on the stroke of half time. With both sides desperate to end the opening weekend on a high there was a clear tension at the start of the second period. Structure and discipline remained paramount throughout the third quarter as chances were minimal and the middle third of the court saw the majority of the action. With 11 minutes to play in the contest, Holcombe won a penalty corner. With the initial flick striking the post, Flor Zapulla finished on the rebound from close range. After the goal was initially awarded, a change of heart ensued and a subsequent re-award of the penalty corner was instructed. After considerable confusion and lengthy discussions with both sides, Captain Steph Elliott stepped up to convert the straight flick and reduce the deficit to 1. With the game reaching fever pitch with just 10 minutes left, some big tackles and poor decisions escalated the emotions on the court. With just 7 minutes remaining, Holcombe composed themselves to win a penalty corner. Captain Michelle Liptrot stepped up to clinically convert her straight flick and restore the two-goal cushion for the Manchester side. Holcombe immediately went on the front foot as they chased the game and saw consecutive penalty corners well saved by Amanda Ferebee in the Bowdon goal. With three minutes left on the clock, Aurora Mears, substituted at half time in place of Grace Lawes in the Holcombe goal, was removed as the Kevin Johnson elected for an extra outfield player in search of a way back into the game. Considerable pressure and two and penalty corners in the remaining minutes weren’t enough for Holcombe as they succumbed to their third successive loss in the Premier League. The result leaves Kevin Johnson’s side sitting precariously in 7th place at the half-way point of the Premier League season. With two teams being relegated from the 9-team league, Holcombe will be in need of a big 4 performances in January to ensure their top-flight survival. Having already played the top four sides from last season however, they will be confident of picking up points when the second half of the season commences. The league recommences on 7th January when Holcombe take on Reading, Sutton Coldfield, Slough and Buckingham.